Figure 4-33. 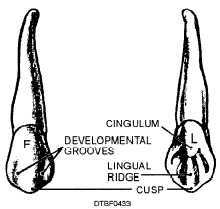 - Features of facial and lingual surfaces of a maxillary cuspid. straight, the cuspid has a definite point, or cusp. There are two cutting edges, the mesioincisal and the distoincisal. The distoincisal cutting edge is the longer of the two. The developmental grooves that are so prominent on the facial surface of the central incisor are present here, extending two-thirds of the distance from the tip of the cusp to the cervical line. Lingual Surface - The lingual surface has the same outline as the facial surface but is somewhat smaller because the mesial and distal surfaces of the crown converge toward the lingual surface. The lingual surface is concave, with very prominent mesial and distal marginal ridges, and a lingual ridge, which extends from the tip of the cusp toward the cervical line. There is often a cingulum in the cervical portion of the lingual surface of the crown. Figure 4-34. - Surfaces of a mandibular cuspid. Root Surface - The root is single and is the longest root in the arch. It is usually twice the length of the crown. This is because the cuspid is designed for seizing and holding food. 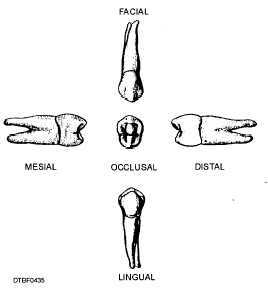 The mandibular cuspid (tooth #22 or #27) is illustrated in figure 4-34. These teeth, like the mandibular incisors, are smaller and more slender than the opposing teeth in the maxillary arch. 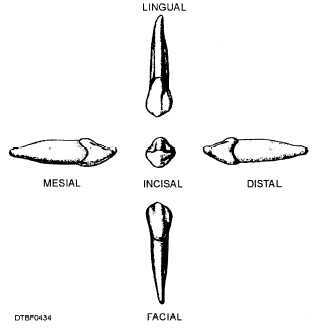 Facial Surface - The facial surface of a mandibular cuspid is much the same as that of a maxillary cuspid, except that the distoincisal cutting edge is almost twice the length of the mesial edge. Lingual Surface - The lingual surface as a rule is very smooth, and a cingulum is rarely present. Root Surface - The single root is not so long as that of the maxillary cuspid and is much flatter mesiodistal. Figure 4-35. - Surfaces of maxillary first bicuspid.